We had to reschedule because my wife had a stroke on the way to the cabin. The staff was very compassionate and accommodating. I very much appreciated their help, concern and prayers. The cabin was very clean and roomy. Nice gas grill. Nice big refrigerator. Nice gas fireplace. We went driving around sightseeing and walking around Bryson City. We ate lunch at the Nantahala Outdoor Center. We drove up the Road to Nowhere and walked thru the tunnel. Went for a hike to see a waterfall in Deep Creek camping area. Drove to Fontana Lake and dam. Ate lunch at Fontana Village. Drove up to Newfound Gap and halfway to Clingmans Done. Overall it was an enjoyable experience. My sister and her husband came from Kansas. We came for the train ride and had a wonderful time. The cabin was wonderful. Thanks, would stay again! The entire process was great -- from research to booking to check-in. Thanks! We came to take a vacation for motorcycle riding in the area; and the area proved awesome for that. We love this little place. Quiet and perfect in every way. The Hot Tub was a blessing after a long day on our bikes. Also helps to relax for the next days adventures. We had a nice time in the cabin. Perfect layout and the view is great. Very clean and comfortable. This is a great property. Convenient to rafting, tubing and the Great Smoky Mountain Railroad. Everyone at GSCR has been friendly. We had a wonderful time riding motorcycles on your beautiful roads - Moonshiner 28 Rd. The cabin was clean and very comfortable! We came to put his Grandmother to rest. He lived on the Reservation growing up. Such a great cabin. Nice to get away and deal with our loss in such a peaceful place. We loved the cabin and had a wonderful stay! It had everything we needed and we enjoyed the hot tub. We loved this cabin and will definitely be back! The location is great, secluded but close to town. It was a great getaway for my husbands birthday! WE had a lovely weekend getaway in this beautiful cabin for two workaholics and celebrated a birthday too! We hope to come back for a summer and fall trip also! Cabin was immaculate! Very homey and full of the comforts of home. The location was great! This was more than we could have anticipated and we will be back soon. Thanks for making 2017 Christmas the best ever!!! We all had a blast riding the Polar Express and enjoying the town. The cabin was the perfect place. The view is wonderful. Will definitely be back. We loved the place - most comfortable and the porch was the best! We enjoyed the view and how the church in town was visible thru the trees - perfect! 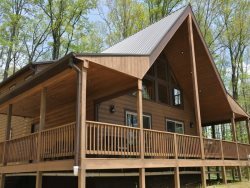 The cabin had all the comforts of home and made our stay so pleasant, We could not have asked for anything more. It was so much better than staying in a hotel, we felt very much at home! We had a very nice time while we were here, close to a lot of things to do. The cabin had all the comforts of home, beautiful views and relaxing time. We will be coming back. We couldn't have asked for a better place to get away for our 5 year anniversary. The cabin was very warm, cozy and inviting while still being central to all the attractions we were interested in. We can't wait to bring our kids back! Thank you for the hospitality. Wonderful time! Loved hiking in the mountains with our 8 year old. The view every morning was new each day. We had a great time, just the two of us. It was just what we needed for our 24th anniversary!